Kosovo (Albanian: Kosovës , Serbian: Kосово) is an independent nation and disputed territory in the central Balkans. After a lengthy and often violent dispute with Serbia, Kosovo declared independence in February 2008. As of 2018, 113 UN states recognise this, and the Republic of Kosovo has become a member country of the IMF and World Bank, despite heavy Serbian opposition. Kosovo, though a secular republic, is largely Albanian-speaking and Muslim but there are also significant numbers of minorities living within its borders, especially Serbs. Kosovo's far north, along with two small regions elsewhere, have a Serb majority and are under local control. Kosovo borders Albania to the west, Montenegro to the north west, North Macedonia to the south, and Serbia (from its perspective) to the north east; the latter frontier is viewed by Serbia as being an internal boundary separating Kosovo (as an internal province) with Central Serbia. 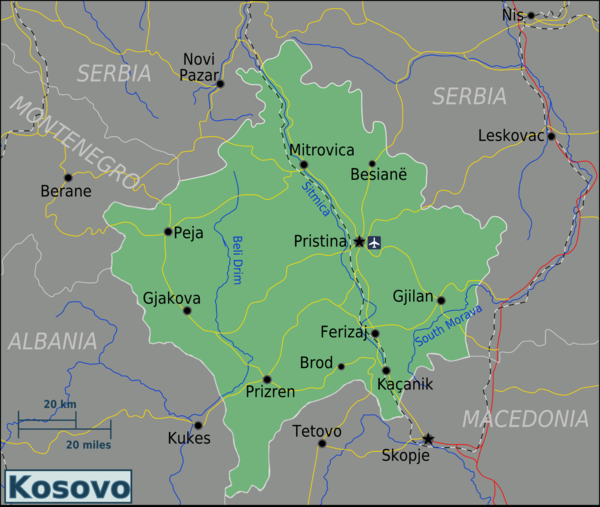 While the legitimacy of the Kosovar government is disputed by many UN countries, from a traveller's point of view the Kosovar government has de facto control of most of the country; local Serb authorities administer five municipalities in the north. This is not a political endorsement of claims by either side in the dispute. The population of Kosovo is about 95% Albanian, who use the name Kosova in their Albanian tongue. Although the official name in English Republic of Kosovo is approved by Kosovo's Albanian-speaking authorities, the word Kosova still finds its way into the English vernacular of locals. Many people in Kosovo can speak English and German; they are more than willing to help you and tell you their stories. If you are interested in more than just seeing beautiful mountains and ancient ruins on your vacation to 'the region', Kosovo strongly recommends itself. The four Serbian Orthdox church complexes that make up UNESCO World Heritage Site of Medieval Monuments in Kosovo - three monasteries, in towns of Gračanica, Peja/Peć and Dečani, and the Church of Our Lady of Ljeviš in the city of Prizren. There are also many more Orthodox monuments of importance throughout the region. Hospitality as a sacred duty - anywhere out of the cities you will be welcomed into people's homes and treated royally. Beautiful countryside for walking with wonderful wild flowers. Nightlife and cafe culture in Prishtina, with the buzz that comes from Europe's youngest population. Seeing the UN and the international community in action (or not!) is quite interesting. You'll get a first hand view of more than 6 different cultures (Albanian, Serb, Roma, Ashkalia, Bosniak, and Turkish). You'll gain an understanding of what happens when governments allow industry to function when both environmental regulations and solid, defensible property rights are scarce. The Kosovars tend to be very friendly towards the UK and USA for its support of their independence (eg: they have "Bill Clinton Boulevard" in Prishtina, as well as a large picture mural of him on the side of a building). They also are very friendly to other Western European and Middle Eastern countries. The climate is continental, with very warm summers and cold and snowy winters. Prishtina (Alba. Prishtinë/Priština) — the capital; a lively city centre with some interesting museums and monuments. UNESCO World Heritage Site of the Monastery of Gračanica is located in the eponymous village southeast of the city. Ferizaj (Alba. Ferizaji/Uroševac) — local church and mosque are literally side by side. Gjakova (Alba. Gjakovë/Đakovica) — although heavily damaged in the war, this city currently features the best nightlife in Kosovo by far, as well as trips to nearby lakes. The çarişa (market) has been renovated and is well worth several hours. It has tekkes of 7 Sufi sects and is home for two of them. Gjilan (Alba. Gjilani/Gnjilane) — city with summer nightlife and close to Draganac Monastery. Kaçanik (Alba. Kaçanik/Kačanik) — a peaceful and quiet town, with an ancient fortress. Mitrovica (Alba. Mitrovicë/Kosovska Mitrovica) — town divided into southern (Albanian) and northern (Serb) sides. The river dividing the city is the political and ethnic dividing line of the region. Peja (Alba. Pejë/Peca) — town with much Ottoman and Serbian Orthodox heritage. UNESCO World Heritage Site of the Patriarchate of Peć is located in the eastern outskirts of the city, and another World Heritage Site, Monastery of Visoki Dečani is located in the nearby eponymous town of Deçan to the south of Peja. Hub for outdoor sports in the spectacular surrounding mountains. The nearby Rugova Canyon is one of the outstanding areas of the country. Prizren (Alba. Prizreni/Prizren) — Capital of the Serbian Empire in the XIV century, this is the most historical city of Kosovo, overlooked by a grandiose medieval fortress. UNESCO World Heritage Site of the Church of Our Lady of Ljeviš is located in the city. There is also a well-preserved Ottoman quarter. A town in which you may still hear Turkish spoken. It also houses the League of Prizren Complex. Podujeve (Serb. Подујево/Podujevo) — A town in the northeast of Kosovo close to the administrative border with Serbia. It has about 75 surrounding villages hence having a lot of traffic. At night time it's bustling, and the cafes and bars are always busy. Velika Hoča (Alb. Hoça e Madhe) — Beautiful medieval village with a centuries-old tradition of viticulture near the town of Orahovac. "Gjeravica" mountain is top of Kosovo with the altitude of 2656m, located in Accursed mountains National Park. "Sleeping Beauty touristic Cave" is located 11km north from Peja, newly opened in 2016, and the second biggest cave in the region. "White Drini natural Park" with White Drini spring and biggest waterfall not only in Kosovo but in the region as well. Kullas are traditional stone houses seen only in Kosovo and Northern Albania. Their design stems from the requirements of the traditional Albanian kanun code for hospitality and for murder to be avenged on the family of the murderer, resulting in blood feuds. A few of these defensible stone houses remain, including in the village of Isniq (where one has opened as a museum), and in the village of Junik and Dranoc (near Peja) where you can stay in a kulla overnight. The village of Velika Hoča has 12 monasteries and churches, excellent wine and raki, and a homestay programme meaning there is accommodation in four restored old houses. 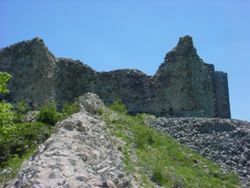 Novo Brdo Fortress is the site of a ruined castle with good walking opportunities nearby as well as homestay possibilities see the local tourism website for more information. In May/June the hill of Novo Brdo Fort is covered in wildflowers. Brezovica is a mainly Serbian village in the Strpce municipality in the South of Kosovo, close to the Sharr Mountains National Park. It is a popular winter destination due to its ski resort. It can also be an interesting place to visit in the summer too as it is an excellent hiking spot and the visitor can enjoy the beauty of the National Park and its surroundings. Prizren. Gadime is a town just half an hour away from Pristina that has an amazing network of caves that you can get a guided tour through. Hajla is the highest peak in Rugova and very adrenaline place for climbing in winter. Nationals of all European Union member states, plus Albania, Andorra, Antigua and Barbuda, Argentina, Australia, the Bahamas, Bahrain, Barbados, Belize, Botswana, Brazil, Brunei, Canada, Chile, Colombia, Costa Rica, Dominica, East Timor, El Salvador, Fiji, Grenada, Guatemala, Guyana, Honduras, Hong Kong, Iceland, Israel, Japan, Jordan, Kiribati, Kuwait, Lesotho, Liechtenstein, Macau, Macedonia, Malawi, Malaysia, the Maldives, the Marshall Islands, Mauritius, Mexico, Micronesia, Monaco, Montenegro, Namibia, Nauru, New Zealand, Nicaragua, Norway, Oman, Palau, Panama, Papua New Guinea, Paraguay, Qatar, Samoa, San Marino, Sao Tome and Principe, Saudi Arabia, Serbia, Seychelles, Singapore, Solomon Islands, South Africa, South Korea, Saint Kitts and Nevis, Saint Lucia, Saint Vincent and the Grenadines, Swaziland, Switzerland, Taiwan, Tonga, Trinidad and Tobago, Turkey, Tuvalu, United States, United Arab Emirates, Uruguay, Vanuatu, Vatican City and Venezuela may enter Kosovo visa-free for up to 90 days within a 6-month period. Nationals of Albania, Montenegro and Serbia may enter Kosovo with any proof of nationality in lieu of a passport. In addition, national ID cards are accepted in lieu of passports for visitors from the European Union, Liechtenstein, Macedonia (biometric ID cards only), Monaco, San Marino and Switzerland. Nationals of any country who hold a valid multiple-entry Schengen visa or a valid biometric residence permit from any Schengen state may enter Kosovo visa-free for up to 15 days. If you are planning to stay in Kosovo for more than 90 days you should, as in any other Balkan country, register at the Police Department for the Registration of Foreigners. This is is next to the central police station in Pristina. The 90 day rule for the registration of foreigners applies to everybody . You can enter Kosovo through the northern border with Serbia through Kosovska Mitrovica or near Pristina. There are bus connections from Belgrade and Nis to Pristina and Prizren and from all the major towns in Serbia to the northern parts. Most used transport route is through the Republic of Macedonia and Prishtina airport. Skopje is only one and a half hours from the capital city of Kosovo, Pristina. Travelling from Pristina to any other city of Kosovo does not take longer than an hour and a half. For instance, from Pristina to Prizren it takes an hour and a half, if there is no traffic, but the most that it will take is two hours. The distance to Peć is also similar. There are many direct flights from Germany, Switzerland and some Scandinavian countries, while the main connecting hubs are via Vienna (Austrian Airlines), Istanbul (Turkish Airlines) and Lufthansa Group (via Munich or Frankfurt). During the summer, several additional charter flights are available for travellers. It is sometimes cheaper to fly into Skopje in Macedonia, which is approximately 2 hours drive from Prishtina. Although there is no direct public transport from Skopje airport to Kosovo, a one-way taxi will cost 60-65 euros. Prishtina-based taxi companies offer this service, including Taxi Victory + 377 44 111 222 (viber also), or Taxi Roberti +377 44 111 999. From Montenegro, you can enter through Rozaje to Peja/Pec(approximately 2.0 hours). There are direct daily buses on the Prishtina-Ulqin/Ulcinj route, which takes approx 5 hours. From North Macedonia, you can take a bus from Skopje to Prishtina (approximately 2.5 h) or Prizren. From Serbia, there are direct buses on Prishtina-Belgrade route, taking approx 6 hours. From Albania, you can enter through Prizren on the new highway. The trip from Tirane costs 10€ and takes 4 h, with two stops. Elsewhere, there are a couple companies offering buses from Istanbul via Skopje, as well as Prishtina-Vienna route. There are also two train lines crossing the Kosovo border: 1. Two trains/day from Kraljevo (Serbia) to Mitrovica operated by Serbian railways and costing 442 Serbian dinars (see timetable); 2. One daily train from Skopje (Macedonia) to Pristina (see timetable). There is a track from Mitrovica to Fushë Kosovë west of Pristina, but it is currently not served by any trains. To enter Kosovo, the validity and acceptance of the International Motor Insurance Card is in doubt. At the border you will need to pay €30 for an insurance extra which will cover you throughout Kosovo for two weeks (Kosovo insurance Bureau  has offices selling insurance at all border crossings). Ensure also that you have your vehicle registration and a power of attorney from the owner if the car is not yours. During the summer holidays in Germany and Switzerland expect long queues at the border crossing in Merdare (up to 10h). At the border the European Motor Insurance/Green Card is not accepted, insurance for a short stay is €15 (as of September 2012). The roads are generally in good condition, and the standard of driving is typical of other countries in the Balkans. However expect large farm animals to be wandering the roads. The best way to travel intercity in Kosovo is by bus. Buses are relatively cheap; Pristina to Peja is €4.00, for example. Within Pristina, rides cost €0.40. You can get a superb atlas of Kosovo from the OSCE that has detailed ethnic maps (before and after the war), vital statistics, along with navigational maps. To get the map, ask for the NGO Information office near the OSCE building in Pristina. Most people in Kosovo speak Albanian. Although almost everyone understands Serbian, it may result in hostile reactions from the mostly Albanian population. Though this is typically not so much of a problem in the southeastern portion of the country which retains a more significant Serb population and tensions are far lower. You can also just ask if someone speaks Croatian instead of Serbian (as they're in fact the same language). English and German are languages that the majority of population speak especially by the younger population. Italian is also spoken, but much more rarely than English and German. The Turkish minority speaks Turkish and Albanian. Turkish is also spoken by some Albanians, especially the older generations. Most people in northern Kosovo are ethnic Serbs, so Serbian will come in handy there. In the southeast the towns of Ranilug, Silovo, Štrpce, Kllokot, Parteš, as well as a few other villages surrounding Gnjilane have Serb populations as well. English and Russian are common second languages here. 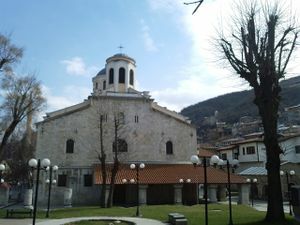 Serbian Orthodox Cathedral of Saint George in Prizren. Prishtina is the capital city of Kosovo. Places that should be visited in Prishtina is the quarter near the National Museum of Kosova. In addition to visiting the museum where a lot of archaeological artifacts are presented, in both ways when you exit, you see the old mosques, since the Ottoman Empire. Prizren. The most historical city in Kosovo, capital of the Serbian empire in the XIV century. It has plenty of beautiful examples of Serbian and Ottoman medieval architecture. UNESCO World Heritage Site - Serbian Orthodox church of Our Lady of Ljeviš (XIV century) is located in the city. UNESCO World Heritage Site - Patriachate of Peć lies 2 km to the west of the Peja city center. It is the mother church of the Serbian Orthodoxy, and it was established in the XII century. It is a beautiful monastery with many spectacular frescoes. 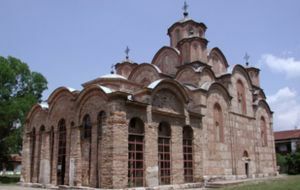 UNESCO World Heritage Site - Visoki Dečani Monastery is one of the most important monasteries of the Serbian Orthodox Church. It is famous for its elegant and peculiar architecture. As an orthodox monastery from the XIII century, it successfuly mixes western and eastern church building elements to form a particular hybrid style only known on the territory of old Serbia. This monastery is particularly noted for some of the world's finest medieval frescoes adorning its walls. It is located near Peja. UNESCO World Heritage Site - Gračanica Monastery is one of the most beautiful examples of Serbian medieval ecclesiastical architecture. This monastery was built by the Serbian king Milutin in the Serbo-Byzantine style. It is noted for its frescoes, and being the only medieval Serbian monastery found in an urban setting complete with an old school and archives. It is located near Prishtina. Serbian Orthodox Monastery of the Assumption of Holy Virgin Mary, Gračanica. UNESCO World Heritage Site. Velika Hoča, a beautiful village with 13 medieval churches and a centuries-old tradition of wine-making. Waterfall Of The Drini River - Located north of Peja behind the Berdynaj village. During the summer, this place is fantastic, and the road to the river is an amazing, narrow road with wires on one side and the river on the other; this is a great part of Kosovo. The Rugova Gorge. The Rugova gorge is also to the north west of Peja and can be found by following the same road that leads to the Peć Patriarchy, and driving further. The canyon has extremely steep walls reaching possibly up to 300 metres. The Gjakova Old Bazaar. A very beautiful old "shopping centre" from 17th century. It was burned down during the war in 1999 and reconstructed recently. In the centre of the bazaar is an old mosque that was built in the 15th century. The Mitrovica Bridge. An interesting symbol of the division of the population in Kosovo. This bridge is the dividing line between Serbs and Albanians in Mitrovice/Mitrovica. It will almost always be safe to approach the bridge and look at it, although the French soldiers who guard it may not let you cross if the political situation is worse than average (average not being so good). The Roma quarter (mahalla) in Gjilan. Gjilan is located to the South East of Pristina. Brezovica Ski Centre - Old infrastructure but great slopes, located in Southern Kosova. Novo Brdo (in Latin documents written as Novaberd, Novus Mons or Novamonte; and in Saxon miners' documents as Nyeuberghe) was mentioned in the historical documents as early as 1326. Novo Brdo was a metropolis at the time, with a huge medieval fortress built on the top of an extinct volcano cone, the remains of which can be visited today, and residential sections sprawling all around. In the outer wall of the fortress, a large cross is visible, built into the stones. The castle dates back to the Byzantine Empire. Ulpiana, one of the oldest cities in the Balkan peninsula, is just 20-30 minutes away from Pristina towards Gjilan. It was re-constructed by emperor Justinian I.
Mirusha Waterfalls on the eponymous river. Visiting a coffee shop in Prishtina, having a macchiato and people watching is quite a popular sport in Kosovo - and you could also try it sometime. Almost 11% of Kosovo's territory is protected as a National Park. In Europe, Kosovo comes only second to Iceland in this aspect. The Sharr Mountains are a mountain range in the South of the country, home to Sharr Mountain National Park and the ski resort of Brezovica. This region is very popular in the winter as a destination of skiers but also has a lot to offer in the summer as it is an excellent choice for hikers and nature lovers that want to explore its paths, peak, small lakes and forests. The remoteness of the area helps travellers to enjoy the environment in tranquillity and peace. As such, Kosovo has an impressive array of mountains, which you can visit yourself - or with the help of some the Alpine/hiking clubs or guides in Kosovo. "OUTDOOR KOSOVO" Tour Operator is the leading company for all your adventure needs, Via Dinarica trail and Peaks of the Balkans trail. Klubi Alpin Prishtina - is one of the oldest hiking clubs, with some guides that are internationally licensed as mountain guides, first aid etc. Their website has info on the mountains, but as of 15/11/15 it is only in Albanian. However, it is worth knowing that they organise at least one group hiking event a week (normally Sundays), which is open to the public. The post destination details weekly on their Facebook page . All you need to do is call and reserve your place, they speak English. +377 44 312 744. Price per person is normally 10 euros, which includes transport, although it depends also on the distance of the mountain. Hiking njeri- normally organises one public hiking trip per week, on the weekend. You can check out their facebook page  for upcoming hikes, information provided in Albanian and English. You can pre-book on 049 248 716 (viber) or 045 834 141. Price per person is normally 10 euros, although it depends also on the distance of the mountain. Klubi Alpin Dardania- is a group of rock-climbing enthusiasts who, in addition to organizing rock-climbing expeditions, spend a lot of their personal time building safe climbing paths, including one at the beautiful Mirusha waterfalls. They also post their public events on Facebook  or you can enquire with Menton on 044/153-093. Price per person is normally 6 euros, excluding transport. Kosovo has the euro (€) as its sole currency along with 24 other countries that use this common European money. These 24 countries are: Austria, Belgium, Cyprus, Estonia, Finland, France, Germany, Greece, Ireland, Italy, Latvia, Lithuania, Luxembourg, Malta, the Netherlands, Portugal, Slovakia, Slovenia and Spain (official euro members which are all European Union member states) as well as Andorra, Kosovo, Monaco, Montenegro, San Marino and the Vatican which use it without having a say in eurozone affairs and without being European Union members. Together, these countries have a population of more than 330 million. The Serbian dinar is the official currency in the Serbian-ruled four northern municipalities and can be used as an alternative to euros in enclaves with Serbian majority such as Gracanica and Strpce. Exchange offices are found almost everywhere. Best restaurants to eat at are those that are located in the villages near by big cities; they tend to have the best meat dishes and the best sea food. Trout, sea bass and salmon fish are very common and popular and are kept fresh in their pools and are nearly always fried when you order. Prices are pretty average and, for some European countries consider, cheap. Lots of great burek (baked pastry stuffed with cheese, meat or spinach). Try the drinkable yoghurt (Ayran) - it's superb. Lots of kebabs and other Turkish style food. As far as you are in an Albanian territory, you could try Albanian food as well. Fli, a very good pastry, that is similar to pie made of layers of crepes can be found in different traditional restaurants. At the bakery, you can buy a fantastic loaf of bread for under €1. The grocery stores have a plentiful supply of Western food. Like many European countries, the legal drinking age in Kosovo is 18, but enforcement is lax. Beer at Peja is a pretty good brew. It is brewed in Peja (Pec). Peja Premium is a slightly stronger beer from the same brewery but less widely available. Since 2012, Kosovo is also home to an artisanal brewery called Sabaja, a joint venture between a home brewer named Alex Butler from New York City and his Kosovar friends Etida and Genc Zeka. Sabaja produces several brews, including ales. Its still not available widely, but you can find it in most bars in central Prishtina. Serbian beer, such as Zajecarsko and Pils Plus, can be found in Serbian bars, restaurants, and supermarkets in enclaves. The average price of beer in cafes is .80 - 1 euro in small cities, 1.50 euro in large cities. Wine is also widely consumed when eating out, some local wine and also Vranac from Montenegro are the most common ones. Even though the Albanians are predominantly of Muslim heritage, drinking is quite liberal. Some of the best red wine is produced by the monks at the Decani Monastery in Western Kosovo. They sell it for between 4 and 8 euros a bottle. Raki is also another alcoholic beverage in Kosova. It is made from local fruits (the most common one is from grape) and can be best described as a hard liquor similar to brandy. It can be quite strong so if you have a weak stomach or do not often drink liquor avoid this beverage. While raki is typically served in a shot glass it's meant to be sipped with mineral water or interestingly coffee. Amongst Serbs, raki or rakija in Serbian is typically made from plums and commonly offered to guests. This is almost always homemade and a source of great pride by the one offering. While in other parts of the world there is good reason to be suspicious of homemade alcohol, in this part of the world no one wants to be known as the person who's raki/rakija poisons their guests. So often it's a safer bet to drink homemade rakija rather than factory made rakija. When toasting local hospitality customs mandates that one cannot toast with coffee or water, but typically with some form of alcohol. One should always look in the eyes of the person you are cheersing with. If you do not wish to drink alcohol then ask for juice or soda which an acceptable alternative. Yogurt/Ayran is also a common local drink and is consumed with pastry foods often Burek. Boza is also another common sweet drink drank with cakes and pastries. Accommodation in Kosovo can be expensive, meaning it is probably the same as hotels in surrounding countries (starts at €25 and goes over €100), and primarily designed for people working for development agencies. Your best bet for finding a place to stay is to look outside of Prishtina (if you're with the car) and to have a contact there ahead of time (even if its just somebody you met over the internet) and stay with them. Or possibly contact some of the smaller development organisations, such as Balkan Sunflowers and online listing of Kosovo hotels, and ask if they can help you with accommodation staying in a rural community, or in the city for a higher price. Try to find a motel -- they are cheaper (around 10€ or 15€ one night), and conditions are usually excellent. You can find one around any major city in Kosovo. Avoid getting too much into politics in Kosovo, although ask as many questions (within reason) as you like. They are very open about their hatred of each other and more than willing to tell you about it. Don’t let the politics stop you from visiting; tensions have risen in a few moments in the past decade, but nearly all have been in the divided city of Mitrovica in the north of the country and with a 10,000+ NATO peace keeping force and a large international Police force, you are very safe from pretty much everything and the chance of a full out conflict is very low with such international supervision and even if one is to occur, all foreigners would be evacuated within 48 hours. You will most likely find peacekeeping soldiers from your own country to help you if you need it. There are few physical or criminal dangers you need to worry about in Kosovo. People in general—both Albanians and Serbs—are extremely friendly and hospitable to tourists. Kosovo is a country that is used to having a vast amount of foreigners from all over the world: since the end of the war, there have been more than 200,000 international workers aiding and rebuilding around the country. The corruption level is extremely low, thanks to the supervision of the EULEX international police, which means it is one of the only countries in Eastern Europe where bribery is pretty much unheard of (unless you have committed a major crime). It can be a different story between the police and organised crime, but this has nothing to do with regular people and tourists. Use only registered taxis, as they have fixed fares and you will not get scammed. Unlicensed taxis are safe, but they will always scam you if you use the meter, so if you have to use an unlicensed taxi, make sure you come to a deal beforehand so the meter is taken out of play. Even though homosexuality isn't illegal, it isn't recognised. Homophobia is somewhat of an issue; people don’t take kindly to homosexuals, but again, physical harm is not an issue unless you openly display affection. As with many other rural and mountainous locations in the region (Macedonia, Montenegro, Albania), you may encounter a Sharr Mountain Dog guarding a flock of sheep or someone's property. The dogs are easily identifiable as being considerably larger than your typical stray dogs with a gray/black coat and wolf like appearance. Sharr Mountain Dogs are very intelligent and very good at their guardian roles. If they see you with their owners they're typically very friendly, if not they can be extremely territorial. As a rule of thumb, if one is barking at you just give it plenty of room and walk around whatever it's trying to guard, whether it's a home or flock of sheep. Like much of the Balkans, land mines were heavily used during the Yugoslav civil wars. Though this was a major problem in the country in the first four years after the war, now it’s a very rare that you encounter them; most suspicious areas are listed in local tour guide books (in particular, the Central Kosovo countryside and Kosovo–Albania border region). It's very safe to go hiking and camping — just ask before you do so to make sure it's not a suspicious area. Most hiking and camping takes place in areas where war did not occur, like the Sharr mountains, where there is a ski and camping resort. Likely stolen to sell as scrap metal, one should keep an eye out for this potential hazard. Whilst not an issue on busy city streets, walking even a few kilometres outside downtown Pristina can be dangerous - particularly when walking in tall grass beside roads or pavements. Local residents use a small pile of sticks and stones to cover open sewer pits, and care should be taken not to step on these either. It is possible for foreigners to obtain treatment at the public hospital in Pristina (staff from your accommodation may come in handy as translators). However, the state of the hospital is far from ideal: The toilets have no soap, infusions are hanging from improvised stands. Kosovo has no public health insurance system and you will be required to pay your bill in cash. A visit to the doctor and a few pills from the pharmacy will cost you around 20 €. If you know what you need you may visit the pharmacy directly as no prescription is needed. Don't pet dogs — stay away from them!!! Whilst most are not aggressive, when they are in packs, they can very well be, so make sure you stay away and don’t run away from them either as dogs chase you when you run; sometimes, the best defence is an attack so charging at them a little usually scares them away. But again, this is only a problem in the outskirts of the cities and at night, as during the day, you will hardly encounter them and they will stay away from humans. There are direct flights from Pristina International Airport to London, New York City, Zurich, Geneva, Gothenburg, Copenhagen, Vienna, Zagreb, Hamburg, Hannover, Dusseldorf, Berlin, Frankfurt,Podgorica, Munich, Stuttgart, Bremen, Rome, Milan, Verona, Ljubljana, Budapest, Tirana, Istanbul and Antalya. Soon, there will be direct flights to Sarajevo and other destinations. There are direct bus links to most cities in Austria, Germany, Italy, Switzerland, Belgium, Albania, Turkey, Macedonia, Bosnia, Montenegro and Serbia. Note that if you plan to go to Russia after Kosovo, you may encounter a bit of trouble entering the country as Russia considers the declaration of independence of Kosovo to be illegal. Kosovo has 2 GSM mobile data providers IPKO and Vala. 2G GSM is on 900 MHz, 3G coverage is still limited on 2100 MHz and 4G/LTE is been rolled out on 1800 MHz only. Networks are limited across the country since speeds vary a lot and the infrastructure is not upgraded to support fast mobile internet use nor the large amount of users.